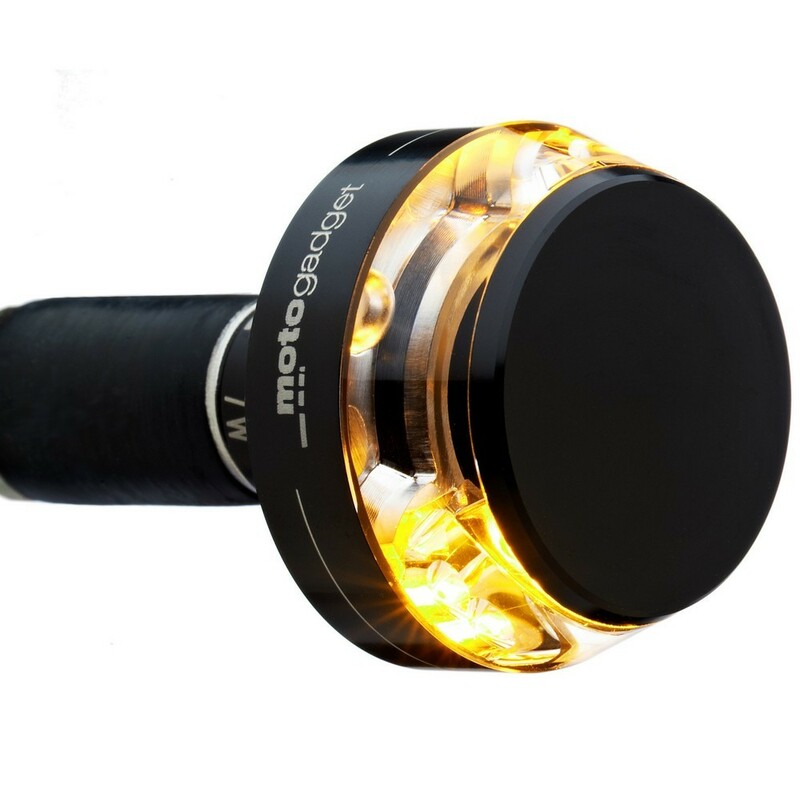 m.blaze disc by motogadget – a turn signal for handlebar end installation in a trend-setting design. 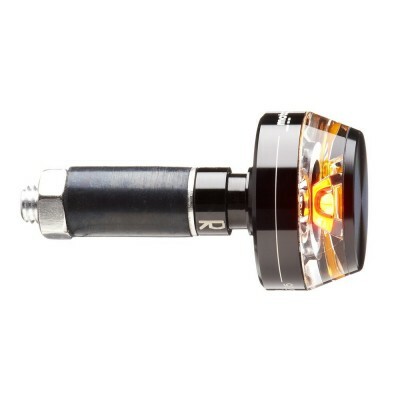 The m.blaze disc is the latest generation of turn signal lights. 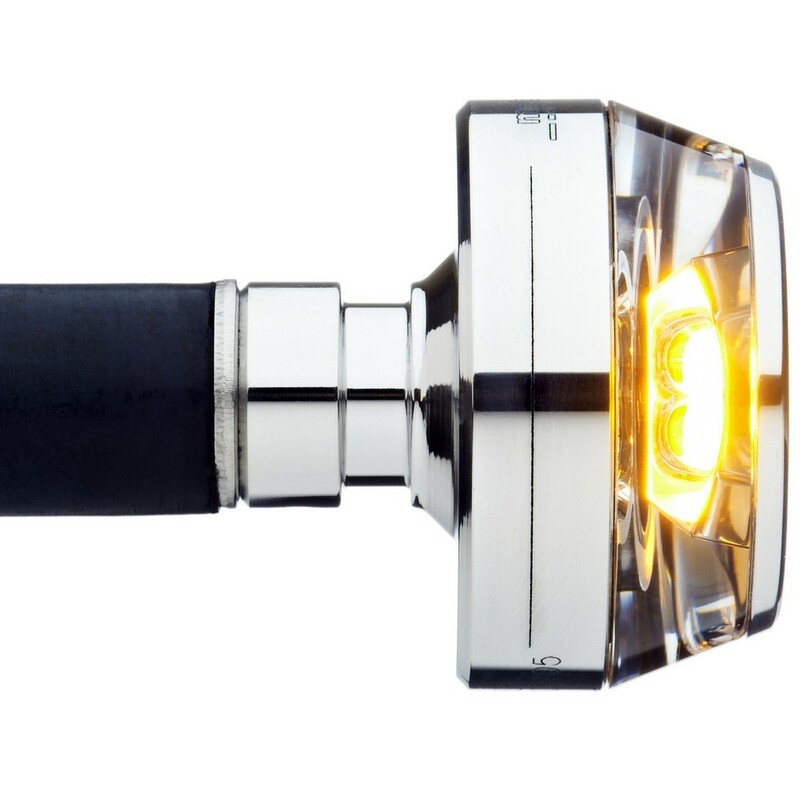 The characteristic feature of the LED turn signal is the transparent light-emitting disc on a compact aluminium base providing the harmonious finish of the handlebar end. This is already the third generation of our turn signals using the motogadget TranzLight-Technology® (TLT, patent pending). This progressive approach to development is not limited to the miniaturization of turn signal casings. Furthermore, it creates new lighting concepts directly through a crystal-like plastic body. Only the precision of CAD calculations and state-of-the-art manufacturing processes allow this new design and its performance opportunities. Specifically selected, high output LED with maximum efficiency and 7W total output and a service life of more than 50,000 hours. IC controlled constant power source with 330 kHz pulses. Special collimator optics, that precisely bundles the emission light from the LED into the plastic body. The subtle aluminium casing is used for the secure mount of the plastic body only and includes the electronic control system and high-end LEDs. 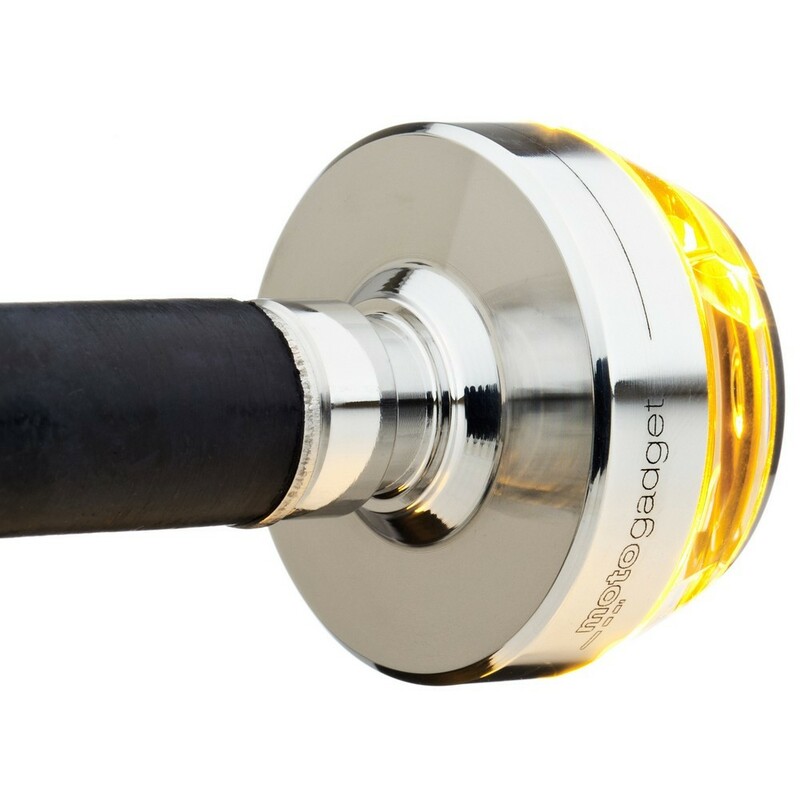 Traditionally, the casing is machined using CNC technology, available with an anodized black or mirror polish surface and furnished with an elegant finish of laser inscriptions. 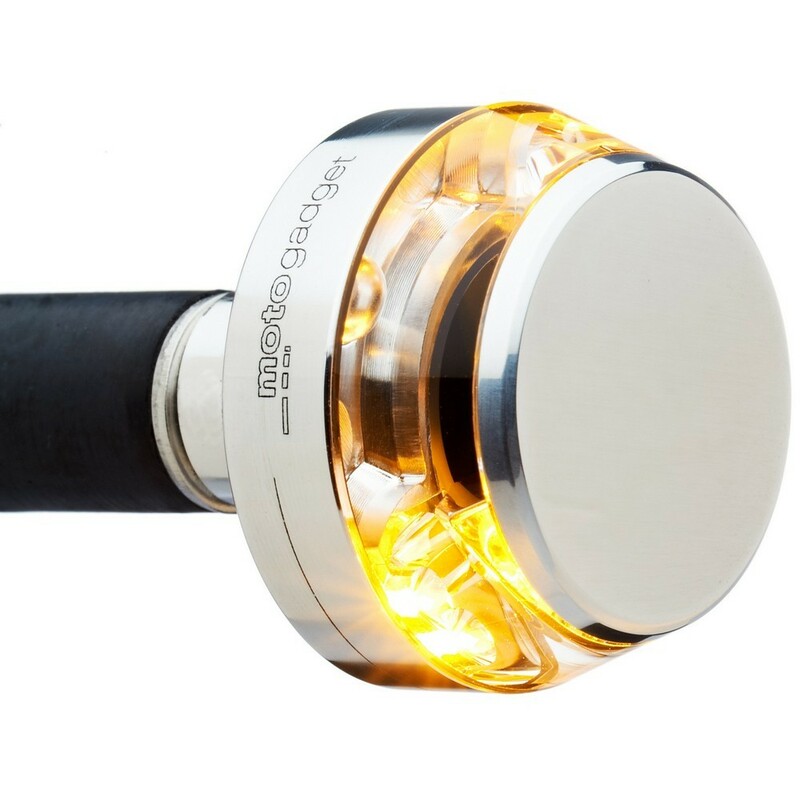 The turn signal for handlebar end installation has a very low construction height and, due to the transparent disc, the m.blaze shows up with a very neutral and subtle look. That's why the m.blaze is the perfect match to many styles and all types of motorbikes. Like any other conventional LED turn signal, the turn signal kit can be operated with load resistors or any of our load independent flasher relays (m.flash, m.wave, m.stop, m.relais+). The m.blaze disc has E mark and front turn signal approval. 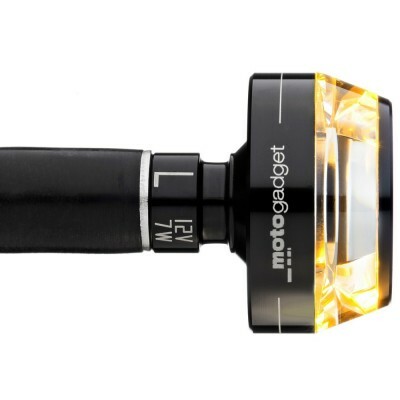 Quite harmonious finish for handlebar end - especially when equipped with m-grip or other billet grips. Mounting Delivered with rubber clamping parts for steel and aluminium handlebars (22 mm and 1 in.) with 14 mm to 21 mm I.D.